This post is part of our Customer Spotlight series. If you have an interesting story to tell and would like to share your experience with WordPress and Elegant Themes on our blog, please contact us! 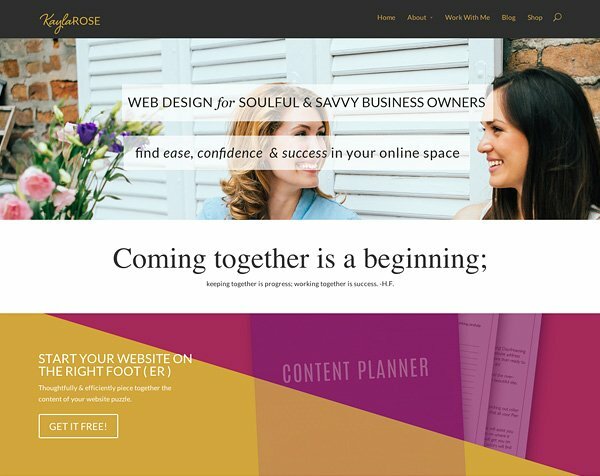 My name is Kayla Rose and I am a web designer for soulful and savvy business owners and I’ve been using WordPress for about 3 years. My son is my inspiration and a motivation for me daily. My journey to where I am today hasn’t been a clear or smooth one, but every bit of it has been worth it. Like a lot of entrepreneurs, I wasn’t always my own boss. During my late teens and early adulthood I worked in customer service and even though I never hated my jobs, I knew there was something more out there for me. Drawing was something I can’t remember not doing and I caught the entrepreneur bug at an early age. When I was 5 I went door-to-door and tried to resell a gift from my grandparents. In 3rd grade I remember going to the craft store making miniature gift baskets that I also took door to door – that’s right miniature baskets stuffed with tiny flowers, because those are always in high demand. When I was in 4th grade, instead of just selling lemonade like a normal child, I created a business plan for a Flintstones themed restaurant and sat outside my apartment door trying to sell people on the idea. Anytime I could embellish or doodle on something I was all over it. I wanted to be a children’s book illustrator and I held on to that for sometime. Through high school I excelled at art and socializing and, well that was about it. As a child and teen I was a doodler with dreams, but along the way I lost sight of what I really wanted to be. Becoming an adult will do that to ya’ – if you let it. I had my son in 2010 and he completely changed my life. I knew that the minute I saw him I wanted him to know that he could be whatever he wanted to be in this world. I didn’t want anything to stop him and I had to take a good look in the mirror and realize that even though I had a decent job, it wasn’t satisfying my dreams. I definitely wasn’t living out my dream: owning a business and being creative in some way. I started out by just doing what I knew, drawing. I explored the world of greeting cards and reached out to somebody who had worked with Hallmark for over 10 years. She was so kind and out of pity or honesty told me that there was a place for me in the greeting card world, but I just needed to hone in on my skills and practice. So I did. I went from using Sharpies and Crayons (Yep, Crayons) to getting my hands on a Bamboo tablet and teaching myself Photoshop. It was pretty gratifying that I was figuring this all out on my own, but it wasn’t enough and I knew I needed to either give up or go to school. I enrolled in the digital illustration program, not having a clue what graphic design even was. Day one, I fell in love. Our first project was displayed up on the critique wall and I felt like I was going to throw up. We were about halfway though the critique and the instructor said, “Who’s is this?” He didn’t even wait for me to answer and said, “This right here, this is a designer!” I thanked him and was silently squealing inside. I was on cloud nine. I thought, this is it I’m going to be a designer! I quit my job, started school full time, and began taking design jobs when I could. It sounds like it all happened fast because it did. About halfway through my program, I changed majors, realizing that Web Design would give me a much better skills set. That’s where my WordPress love story starts. I took on my first website client and the rest is history. I loved what I could do and how CSS could turn a plain Jane theme into something unique. At this point I had already started taking on clients, creating logos, brochures, and other small collateral projects here and there. Once I added in WordPress I knew I could offer so much more. I knew that entrepreneurship was pretty much my set path. When I graduated I had a full plate of clients. And I’m not talking Phil Collins kind. Having gone through the pits of Themeforest, when I started using Genesis it was breath of fresh air. It took me a bit to really know and learn Genesis, but once I got the hang of it I became a loyal customer. Waving my Studiopress flag throughout the interwebs. I was pretty set that this was what I would be using for a while. What? I’m back in school? As it turns out, when you love something learning isn’t too shabby. Last month I was invited into the beta mentorship program and I felt like I had received the golden ticket. There is no other program out there like this for designers. This first month of this program I had huge business “aha’ moments. These were things that I knew would affect my business for the better and wanted to put them into action immediately. For that to happen I needed to change up my site. I was seeing Divi everywhere and I didn’t have any plans on leaving Genesis, but I thought since I was making some changes I might test it out. Within the first 10 minutes I was hooked. Genesis who? I was smitten over the functionality and the intuitiveness of it. It took me about one week to learn the basics of Divi and re-design my site. I was able to customize my site even more by using custom CSS. The fact that I was able to do exactly what I wanted without a huge learning curve was a dream. The cherry on top is that my conversion rates have doubled in the one week my new site has been up. I’ve used multiple Themeforst themes, Paglines, and Genisis, but Divi has been a homerun for me. I’m really looking forward to using Divi for my upcoming projects. I work with like-minded business owners and though we all have common ground, each one is unique in their own way. Each one has different goals, personalities, and talents and being able to have a GO-TO theme that I know I can delivery the uniqueness they are seeking is a beautiful thing for my business and theirs! Kayla is a savvy business owner and web developer that helps companies re-invent their online their online image. She has a passion for all things design and loves helping others. Kayla recently re-designed her own website using our Divi theme, and it looks great! WordPress will never cease to surprise you and you will always learn more and more. Thanks BB, that’s one hell of compliment! Great story – I too am a lover of Genesis who is currently rebuilding my StudipPress-themed site (rcfreelancing.com) to a Divi-foundation site (http://fiction.rcfreelancing.com). While I LOVE the amount of work I can do to a Genesis Theme, now that I’m more versed in code and design, I’m IN LOVE with Divi and its beauty and functionality. Right!? Divi is great. Your site looks awesome btw! ahhhh im getting more and more inspired! thank you for this post! i really like how you made your site simple and clean yet very visually appealing. btw, in your blog, i think you misspelled the designer? P.S. I can not for the life of me see where The Designer is misspelled, it’s killing me! haha.. what a major fail on my part if it’s hidden in there somewhere! Hi Kayla, I absolutely love your site. Every last detail is meticulously thought out, and the color scheme is both elegant and playful simultaneously. Thanks for sharing your story too. I enjoyed reading it very much. That is so nice to hear. Designing for yourself always seems like the hardest job ( at least for me it is! ). I’m so happy to hear that what I wanted to portray is shining through! Another informative post. Learn lots of new things from it. Thanks for sharing your experience with us. I wasn’t actually sure if I was going to add that part in, but it’ s huge piece of my story and really what pushed me forward! I don’t even think my instructor knows that.. I might just have to send him this link! Lovely post, really informative, beautiful work. I love those two apps! Glad you enjoyed it and thanks! Like you I’m a complete Genesis Groupie and a big fan of Brian Gardner. I actually started out with WordPress using Elegant Themes EBusiness theme and then moved all my sites and client sites over to Genesis. recently I found the Divi theme and loved it so much… I set up a dedicated Divi site so in a way I’ve come full circle. Funny how that works huh? I thought I found ‘the one’, but you can’t really every guarantee anything with this amazing world of technology! Very interesting article Kayla, enjoyed reading. Completely agree with you that kids are first source of motivation and inspiration as we always starting our day with them. Thanks for sharing. Kayla – you know how proud I am of you lady! You’re just rockin’ this year. We should rename 2014 as the year of Kayla Rose! What Rach said! Amazing post by an inspiring designer! Kayla, what a lovely story, quite similar to mine in some ways. I’m totally hooked on Divi and only on day 2 of becoming a subscriber to ET. I know I have lots still to learn about mastering this wonderful theme. I love designing websites and am now only working half a week from what was a full time job, Im trying to build my web design and digital marketing company and give freelancing a go. So who knows what the future holds. So excited everyone else gets so excited about this theme too – awesome and best of luck with the business and btw website is amazing. After about a fifteen minute conversation and some inspiration photos, Kayla interpreted EXACTLY what I wanted and brought my blog vision to fruition. She is amazing!!!! But what I really love about Kayla is her passion for what she does – she’s dedicated, excited and focused. It’s hard to find designer/creatives who also know business and how to adhere to deadlines. She can do both and I’m grateful for her expertise! That is one awesome looking website, Kayla. Congratz! Nice work. Just wanted you to know that some of the images are not showing on the left side of the resources page.